Welcome to the first edition of “Meet the Athlete”, where you can learn a bit about BrittFit athletes– newbies, recreational athletes, and future Olympians. 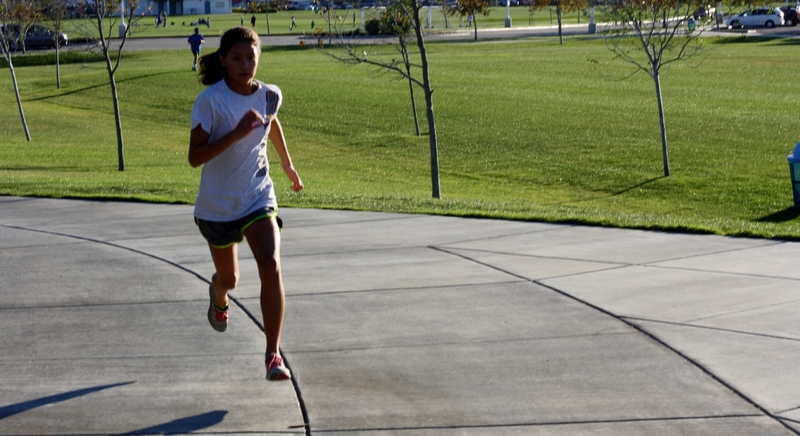 Let’s meet Teagan, BrittFit High-Performance Youth athlete since Fall 2013. Last Friday, Brice and I drove our new (used) Honda Element (which we love) up to Truckee to visit some most excellent friends. When we finally arrived, after sitting in the car for a total of about 9 hours, it was so nice to be in the middle of beautifulness. Jon and Jessica live on a mountain surrounded by tall trees, fresh air, and quietness. Ahh. Jessica and Jon eat well, so we basically ate whole, fresh, foods all day and night, when we weren’t off exploring the river or eating cupcake splits (more on that later). Saturday morning, we woke up at 6(ish), had breakfast (oatmeal with granola, almonds, banana, and milk, plus an orange…and coffee, of course–yum! ), and headed to Donner Lake. The guys dropped us tough ladies off to pick up our packets, use the facilities, get our bodies marked (race numbers), and march to the beach for the race start. I really enjoyed the relaxed vibes at this packet pickup. Triathlon packet pickups (especially on race morning) typically carry with them a lot of rushing and nervousness (but maybe it’s just me). Walking to the beach was calm as well. No feet rushing by or hurriedly trying to pass us up. We took our time, and so did everyone else, it seemed. We waited around on the sand at the shaded start area, and then took a quick dip to let our bodies get acquainted with the cold(ish) water–but it was 68 degrees, which was actually a lot warmer than what I’d expected. After our “warm” up, we found Jon and Brice…err…they found us. We left our stuff in numbered plastic trash bags (which were carried to the other side of the lake by boat for us to pick up at the finish). I slurped a Honey Stinger energy gel (so good!) 15 minutes before the start, and off we went. The start signal was not highly distinguishable, but after a couple milliseconds of looking at each other confusedly, we all decided to start swimming. There were a few nudges against other swimmers, but the field spread out within a few minutes. This spreading was made wider by the fact that there were no site buoys throughout the swim– we just charged straight (well, as straight as we could navigate on our own) to the opposite side of the lake. While there were no site buoys, I could see the orange finish chute across the lake. I tried to keep my eyes on this about every 10 strokes. There’s no telling if it worked, or if perhaps I swam an extra half mile. Things got a bit confusing about 30 minutes in, when I could clearly see packs and lines of swimmers a good 50 yards to my right and left. 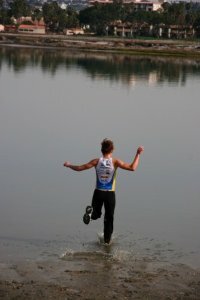 I guess that most swimmers took to the outsides of the lake, while I seemed to be straight in the middle. Was there some secret that I wasn’t let in on? 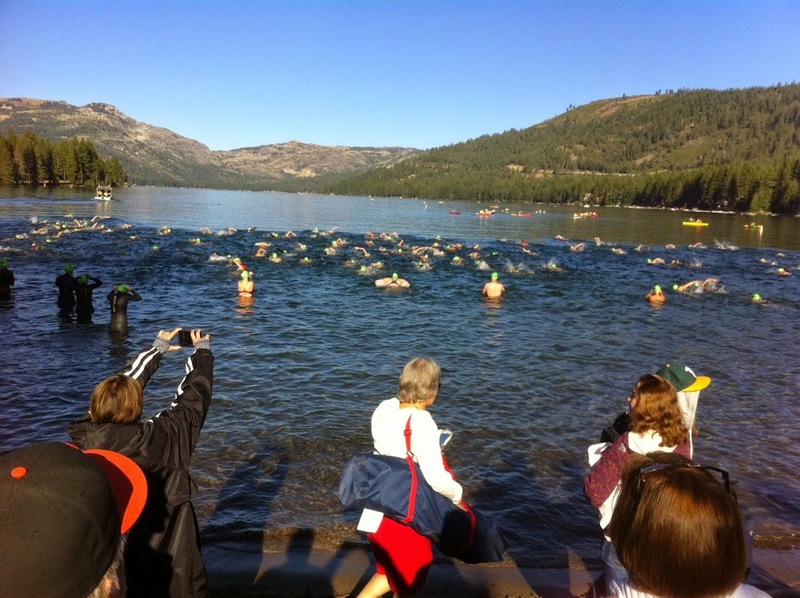 There were a few odd swimmers scattered throughout the middle, but most were off to the sides, and I was alone for about 90% of the race with at least a 25-yard radius of clear water around me. Oh well, I just kept swimming. After about 50 minutes of swimming (I wore my pink Soleus watch…good decision! It helped me keep tabs on how long I’d be going, and to estimate how much longer I’d have to go, approximately), and still feeling great at this point (thanks, Honey Stinger gel), I turned my head to the right to breathe and saw my hubs and his friend Jon in their canoe. Apparently, the pink watch was about the only thing that distinguished me from the other 400 swimmers in black suits and green caps. The guys were fist-pumping and yelling encouragements at me. It made me smile (and spit some water at them). After that, I decided to gun it in to the finish, assuming it was pretty close. I kept turning up my tempo and kick, but the finish was not coming fast enough. Finally, at a total time of 1-hour and 8-minutes, I reached the beach. With wobbly legs, I stood up and jogged across the finish line. Brice and John had just arrived on the shore, so they cheered Jess and I into the finish. Post-race foods and drinks were superb! Fruit, bagels, nutella, pb, hot cocoa, lemonade…and complementary lunch was served to finishers: bbq chicken sandwhiches, salad, and beer on tap! I would definitely do this swim again. Such a fun experience. The environment after the race was just as relaxing and friendly (and even more fun!) as it was before the race start. People hung out with their families and friends on the beach, in the warm sun, snacked, went Stand-Up-Paddling, kayaking, and cheered on finishers until the 2-hour and 30-minute cut-off time. After the race, and nap time, Jess, Jon, Brice, Kenai (Jon and Jess’s amazingly entertaining and sweet Husky), and I played in the river (walking distance of their house), then went for ice cream. The ice cream shop happened to also be a cupcake shop. 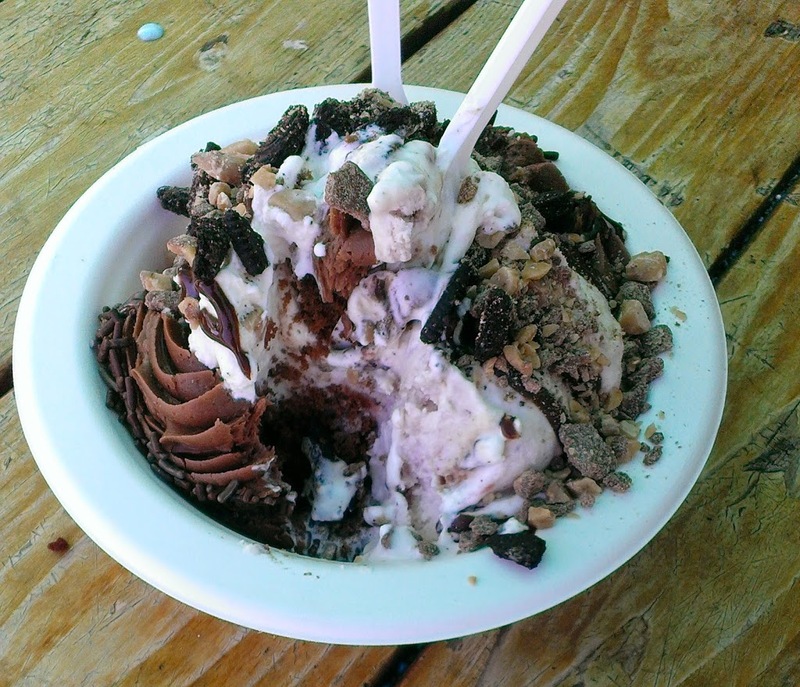 So, Brice and I shared a “cupcake split” which consisted of a chocolate cupcake, caramel pecan and strawberry ice creams, chocolate sauce, house made whipped cream, and crushed candy-cookie toppings. So good! It was a beautiful day for a swim in the lake, and a beautiful weekend with friends. Plus, I got to take home a pretty “Donner Lake, 2014” embroidered towel for an age group win! Fancy Swag. Arrive early to meet/prep/warmup. Workout will begin at 6am and end by 7am. Workout will include water entry, exit, race pace circuits, beach running between circuits, etc. Parking is available (early mornings are free!) in the lot on Harbor Blvd and California St.
From the 101 N, exit 70A for California St. Make a left on S California St. If you would like to join in on the craziness, please contact me by commenting on this post, or by leaving a message/comment on the BrittFit Facebook Page. Your response is necessary so that I can be sure to let you know of any changes/cancellations. I will also ask you to fill out the mandatory online waiver before attending a workout with me. Arrive at 5:45am (July 19th and August 2nd) or 6am to meet/prep/warmup. Workout will begin at 6/6:15am and end at 6:45/7am. Varied start times account for differences in daylight hours. You are welcome to stay later, but buoys will be removed. If you would like to join in on the craziness, please contact me by commenting on the post, or by leaving a message/comment on the BrittFit Facebook Page. Your response is necessary so that I can be sure to let you know of any changes/cancellations. I will also ask you to fill out the mandatory online waiver before attending a workout with me.